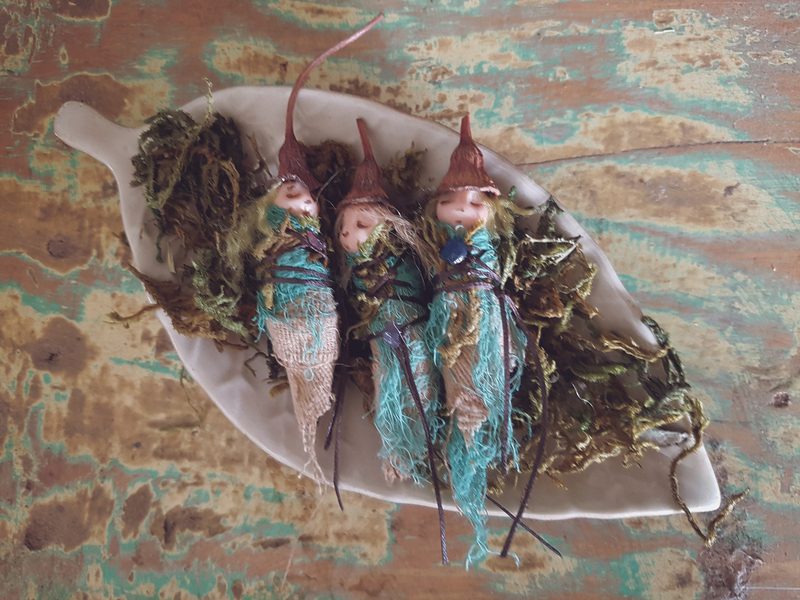 So, I’ve been absent for a while.. preserving dead faeries n stuff, the usual. Anyway I’ve been making and painting heaps since I’ve been gone so I thought I’d try and post something new (almost) everyday.. try to keep this blog interesting and keep myself out of trouble. Not that I get into trouble. Much. 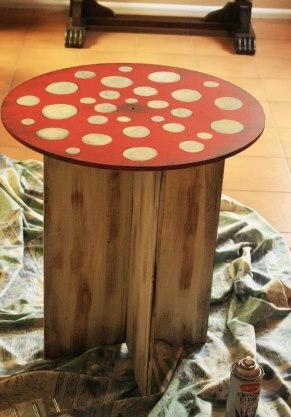 Anyhoo, something I created recently that got some good feedback on Facespaz was my toadstool table! It cost me next to nothing, mainly because I found* the table in hard rubbish. It actually sat in the spare room for a while before I finally decided to paint it or get rid of it. So I painted it. I’m not sure why I didn’t see it as a ‘toadstool’ from the start as it has a round top. Inspiration sparked when I realised this and I got started straight away. Step One: Clean.. boring. It had some webs and dust so I gave it a quick clean and sanded back the dodgy corners. Step Two: Stain. Ok, this step wasn’t really necessary and if I did it again I’d leave this step out. I thought if I stained the chipboard it would show through when I sanded back the paint (you’ll see in the next few steps) but it didn’t work that way so learn from my mistake, don’t bother! Step Three: Paint! Obviously, I used red and white. 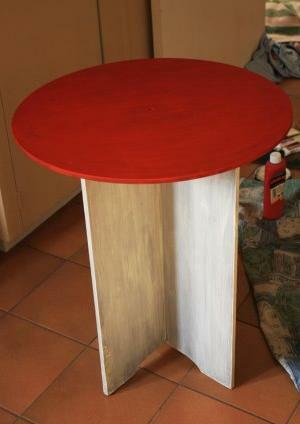 I used one tube of red acrylic for the top, and about 3-4 tubes of white (off white) for the base. Two coats. It left an opaque finish and this is where I decided to give it an ‘old antique’ look otherwise it was going to take at least another 2 or more coats on the base. Better yet, I could’ve used house paint but it was too late for that. I’m a bit of a trial and error type artist. Step Four: To give that ‘old’ look I looked up a few tutorials only to find it was too late to do most of them. So I made it up myself.. using brown paint and a dry brush I ‘skimmed’ the brush over the white paint to try and give a look of faded/rubbed off paint if that makes sense? I made sure I put brown on all corners and edges so it looked like there was dark brown wood underneath showing through. I also painted brown spots on the top and left it to dry. 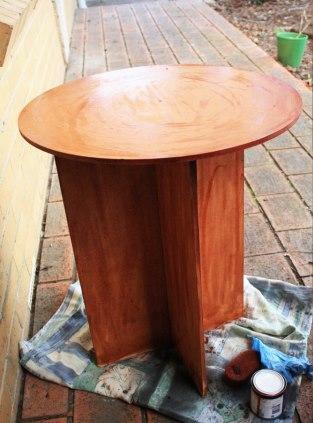 Step Five: Finally, I sanded back areas where I put too much brown paint just to rough it up a bit and ‘stress’ it. I also painted white spots on top of the brown ones, allowing some brown on the edges to show. Step Six: Lastly I painted a coat of matte finish varnish to protect it. About two coats. Ta da! Antique-ish-looking toadstool table! *Found – as in it was on the nature strip outside my neighbors house. I’m pretty sure it was up for grabs.